Philip II became King of Macedon in 359 BC. After securing the borders to the north, east and west, he began the expansion south into Greece, waging a war against the combined forces of Athens, Thebes and their Allies that would end at Chaeronea, his greatest victory. 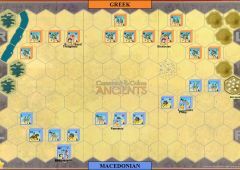 This was the first and only battle where the whole Macedonian Army gathered in full (up to 24,000 phalangites and almost all the cavalry squadrons): four years later Alexander took half of the army to Persia and Antipater kept the other half to secure Macedonian hegemony in Greece. The Allied force held a strong position between the Chaeronea Acropolis and the marshes along the river Cephissus. The Athenian hoplites were on the left, the smaller contingents from other city-states next to them in the center, and the Thebans, including the elite Sacred Band, held the right. 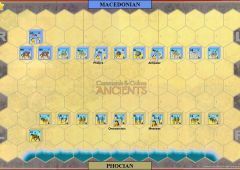 Philip formed the Macedonians into an oblique line, a tactic he learnt in Thebes from Epaminondas himself. Opposite the Athenians, and closest to the enemy line, he placed himself and the Hypaspists. The rest of his phalangites stretched to the left and backwards, with light cavalry on the extreme left. Prince Alexander commanded the Companion cavalry, held behind the line in reserve. On contact, Philip withdrew his forces drawing the Athenians forward. 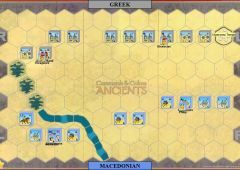 The Thebans refused to move from the river bank, opening a gap in the center of the line which Alexander charged through with his Companions. The other cavalry now attacked the opposite flank of the Sacred Band. At the same time, Philip advanced with his phalanx against the disrupted Athenians and broke them. 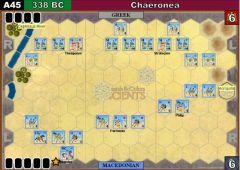 The Thebans, attacked to flank and rear, fought to the last man expunging the dishonour of Plataea, where they had joined the Persians against Greece. Macedon’s supremacy over the Greek city-states was finally established, and the Hellenic Crusade against Persia could start at last. Terrain: the river is fordable, the forest hexes do not block line of sight (marshes), and the Chaeronea Acropolis plays as a forti ed camp and a hill. 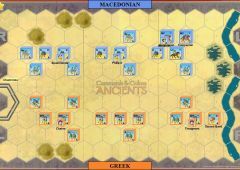 Alexander (use Alexander block ): the unit with Alexander battles with 1 additional dice in Close Combat. Special Units: the Theban Sacred Band , Alexander’s Companions and Philip’s Hypaspists will ignore 1 sword symbol and may ignore 1 flag.